Stuckylife |: Quoth the Crowe: "After a couple of hours on the bike, you've earnt a couple of fags." Quoth the Crowe: "After a couple of hours on the bike, you've earnt a couple of fags." 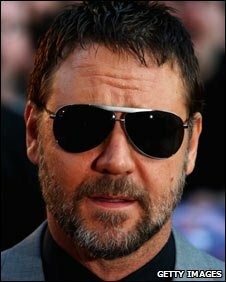 Russell Crowe challenged an Australian newspaper columnist to a cycle duel after she mocked a picture of him smoking and eating on a bike ride. The piece, in Sydney's Daily Telegraph, was headlined "smokes and fatty foods the fitness regime for Rusty". The Gladiator star then called the paper to challenge Annette Sharp to a 12-mile (19.3km) race through the city. Video of the early morning duel showed Crowe speeding along with Ms Sharp struggling to keep up. Crowe is shown telling Ms Sharp she is a better cyclist than Australian film director Baz Luhrmann. "He holds the record for the worst cycling tourist we've ever taken for a ride - you are twice the man Baz Luhrmann is on a bicycle." The Telegraph mocked Crowe last week after he was photographed taking a break from a bike ride with his personal trainer to smoke a cigarette, eat tacos and drink a soft drink. The paper reported that Crowe's spokesman had called the next day and said: "Get on your bike. Russell wants you to go riding with him. No, but I guess I would be down to bum a fag or two.